(1) Sûta said: "I offer Him my obeisances, the Godhead who in arrangements of mantras from the Vedas, their limbs [the angas] and the Upanishads with transcendental prayers is praised by Brahmâ, Indra, Rudra and the children of heaven [the Maruts], the Godhead about whom the Sâma Veda chanters are singing, the Godhead upon whom the yogis who see Him in their minds concentrate in meditation, He whose end is not known to anyone among the enlightened and unenlightened souls. (2) The Supreme Personality of Godhead in the form of a tortoise [Kûrma] became sleepy from the scratching edges of the stones of Mandara mountain that most heavily rotated upon His back. May all of you be protected by the winds that are the traces left behind by the flow of His breathing and by the ceaseless tides of the ebb and flow of the water that up to the present day follows the example of His in and outgoing breath. (3) Please listen now to a summation of the number [of verses] of the Purânas, what the purpose is of its subject matter, how the book should be given as a gift, what the glory of that gift-giving is and what the blessing is of the reading and such of this text. (4-9) The Brahmâ Purâna has ten thousand verses, the Padma Purâna counts fifty-five thousand, the S'rî Vishnu Purâna twenty-three thousand and the S'iva Purâna twenty-four thousand. The S'rîmad Bhâgavatam counts eighteen thousand verses, the Nârada Purâna has twenty-five thousand, the Mârkandeya Purâna nine thousand and the Agni Purâna fifteen thousand four hundred verses. The Bhavishya Purâna has fourteen thousand five hundred verses, the Brahma-vaivarta Purâna counts eighteen thousand and the Linga Purâna eleven thousand verses. The Varâha Purâna offers twenty-four thousand verses, the Skanda Purâna eighty-one thousand one hundred and the Vâmana Purâna is described in ten thousand verses. The Kûrma Purâna is described in seventeen thousand verses, the Matsya Purâna has fourteen thousand of them, the Garuda Purâna next has nineteen thousand verses and the Brahmânda Purâna counts twelve thousand verses. In sum the Purânas are thus expressed in four hundred thousand verses [*]. Eighteen thousand of them constitute, as said, the Bhâgavatam [see further under Purâna]. (10) This [tale of wisdom] was by the Supreme Personality of Godhead [Narâyâna, see 3.8-10] out of mercy for the first time in its entirety revealed to Brahmâ who fearful of a material existence sat upon the lotus that grew from His navel [see also 1.1: 1]. (11-12) From the beginning to the end filled with accounts about renunciation it delights the saintly and godly souls with the nectar of its many narrations about the Lord's pastimes. With beatitude [or eternal happiness by emancipation in devotional service] as its one ultimate goal, it has as its prime subject the One Reality Without a Second - the essence of all Vedânta philosophy - that is characterized by the non-difference of the Absolute [impersonal] Truth [brahman] and the One [personal] Soul [âtma **]. (13) He who gives the Bhâgavatam as a gift on the day of the full moon in the month Bhâdra [August/September, in its full glory as the king of all literature] seated on 'a golden throne' [in the constellation of Leo], reaches the supreme destination. (14) Other classical collections of stories [other bibles, other Purânas or holy scriptures] are prominent in the assembly of the saintly only for as long as the great ocean of nectar that is the Bhâgavatam is not heard. (15) The S'rîmad Bhâgavatam constitutes the essence of all Vedânta philosophy, someone who found satisfaction from the taste of that nectar will never feel attracted to anything else [to other sacred scriptures]. (16) Of all Purânas this one is like what the Ganges means in relation to all rivers flowing towards the sea, what Acyuta, the Infallible One, means in relation to all deities and what S'ambhu [S'iva] means in relation to all Vaishnavas. (17) Just as unsurpassed Kâs'î [Benares] is among all holy places, S'rîmad Bhâgavatam is matchless among all the Purânas, oh brahmins. (18) S'rîmad Bhâgavatam is the spotless Purâna most dear to the Vaishnavas in which the perfectly pure and supreme spiritual knowledge is celebrated of none but the best devotees. Therein the freedom from all fruitive labor is revealed together with the [therewith associated] knowledge, detachment and devotion that will deliver the person who in consideration of the transcendence with his devotional service manages to listen and exercise the mantras the way it should. (19) I meditate upon the incomparable torch light of the Immortal Supreme Immaculate Pure Truth Free from Sorrow who long ago revealed this transcendental knowledge to the deity ['Ka' or Brahmâ], who transferred it to Nârada the great sage who delivered it by means of his personal form to Krishna Dvaipâyana Vyâsa who next handed it down to the king of the yogis [S'ukadeva] who on his turn was as merciful to reveal it to [Parîkchit] the grace of the Fortunate One. (20) I offer Him my obeisances, the Supreme Personality of Godhead Lord Vâsudeva, the Supreme Witness who mercifully explained this [story, this science] to [Brahmâ] the deity who desired liberation. (21) I offer him my obeisances, the king of the yogis, S'ukadeva Gosvâmî, the personal manifestation of the Absolute Truth who freed [Parîkchit] the grace of Vishnu who was bitten by the snake of material existence. (22) Oh Lord of Lords, You are our Master, therefore please make it so that we life after life may rise up in bhakti at Your feet. (23) I offer my obeisances to Him, the Supreme Lord, whose congregational chanting of the holy name destroys all sins and to whom bowing down all misery finds its end." Thus the twelfth Canto of the S'rîmad Bhâgavatam ends named: The Age of Deterioration. With this last Canto the Story of the Fortunate One ends, the Bhâgavata Purâna also known as the S'rîmad Bhâgavatam and the Paramahamsa Samhitâ. All glories to the Brahmâ-Mâdhva-Gaudiyâ Sampradâya paramparâ of the foregoing Vaishnava âcâryas headed by Lord Gauranga, S'rî Krishna Caitanya Mahâprabhu, who by their commentaries, translations, bhajans and lectures made this presentation possible and brought the full of the Vaishnava culture to the humble western servant of Krishna, Anand Aadhar Prabhu, who in truth is never finished with his work. Third revised edition, loaded December 23, 2015. Sûta said: "I offer Him my obeisances, the Godhead who in arrangements of mantras from the Vedas, their limbs [the angas] and the Upanishads with transcendental prayers is praised by Brahmâ, Indra, Rudra and the children of heaven [the Maruts], the Godhead about whom the Sâma Veda chanters are singing, the Godhead upon whom the yogis who see Him in their minds concentrate in meditation, He whose end is not known to anyone among the enlightened and unenlightened souls. The Supreme Personality of Godhead in the form of a tortoise [Kûrma] became sleepy from the scratching edges of the stones of Mandara mountain that most heavily rotated upon His back. May all of you be protected by the winds that are the traces left behind by the flow of His breathing and by the ceaseless tides of the ebb and flow of the water that up to the present day follows the example of His in and outgoing breath. Please listen now to a summation of the number [of verses] of the Purânas, what the purpose is of its subject matter, how the book should be given as a gift, what the glory of that gift-giving is and what the blessing is of the reading and such of this text. The Brahmâ Purâna has ten thousand verses, the Padma Purâna counts fifty-five thousand, the S'rî Vishnu Purâna twenty-three thousand and the S'iva Purâna twenty-four thousand. The S'rîmad Bhâgavatam counts eighteen thousand verses, the Nârada Purâna has twenty-five thousand, the Mârkandeya Purâna nine thousand and the Agni Purâna fifteen thousand four hundred verses. The Bhavishya Purâna has fourteen thousand five hundred verses, the Brahma-vaivarta Purâna counts eighteen thousand and the Linga Purâna eleven thousand verses. The Varâha Purâna offers twenty-four thousand verses, the Skanda Purâna eighty-one thousand one hundred and the Vâmana Purâna is described in ten thousand verses. The Kûrma Purâna is described in seventeen thousand verses, the Matsya Purâna has fourteen thousand of them, the Garuda Purâna next has nineteen thousand verses and the Brahmânda Purâna counts twelve thousand verses. In sum the Purânas are thus expressed in four hundred thousand verses [*]. Eighteen thousand of them constitute, as said, the Bhâgavatam [see further under Purâna]. This [tale of wisdom] was by the Supreme Personality of Godhead [Narâyâna, see 3.8-10] out of mercy for the first time in its entirety revealed to Brahmâ who fearful of a material existence sat upon the lotus that grew from His navel [see also 1.1: 1]. From the beginning to the end filled with accounts about renunciation it delights the saintly and godly souls with the nectar of its many narrations about the Lord's pastimes. With beatitude [or eternal happiness by emancipation in devotional service] as its one ultimate goal, it has as its prime subject the One Reality Without a Second - the essence of all Vedânta philosophy - that is characterized by the non-difference of the Absolute [impersonal] Truth [brahman] and the One [personal] Soul [âtma **]. He who gives the Bhâgavatam as a gift on the day of the full moon in the month Bhâdra [August/September, in its full glory as the king of all literature] seated on 'a golden throne' [in the constellation of Leo], reaches the supreme destination. Other classical collections of stories [other bibles, other Purânas or holy scriptures] are prominent in the assembly of the saintly only for as long as the great ocean of nectar that is the Bhâgavatam is not heard. The S'rîmad Bhâgavatam constitutes the essence of all Vedânta philosophy, someone who found satisfaction from the taste of that nectar will never feel attracted to anything else [to other sacred scriptures]. Of all Purânas this one is like what the Ganges means in relation to all rivers flowing towards the sea, what Acyuta, the Infallible One, means in relation to all deities and what S'ambhu [S'iva] means in relation to all Vaishnavas. Just as unsurpassed Kâs'î [Benares] is among all holy places, S'rîmad Bhâgavatam is matchless among all the Purânas, oh brahmins. S'rîmad Bhâgavatam is the spotless Purâna most dear to the Vaishnavas in which the perfectly pure and supreme spiritual knowledge is celebrated of none but the best devotees. Therein the freedom from all fruitive labor is revealed together with the [therewith associated] knowledge, detachment and devotion that will deliver the person who in consideration of the transcendence with his devotional service manages to listen and exercise the mantras the way it should. I meditate upon the incomparable torch light of the Immortal Supreme Immaculate Pure Truth Free from Sorrow who long ago revealed this transcendental knowledge to the deity ['Ka' or Brahmâ], who transferred it to Nârada the great sage who delivered it by means of his personal form to Krishna Dvaipâyana Vyâsa who next handed it down to the king of the yogis [S'ukadeva] who on his turn was as merciful to reveal it to [Parîkchit] the grace of the Fortunate One. I offer Him my obeisances, the Supreme Personality of Godhead Lord Vâsudeva, the Supreme Witness who mercifully explained this [story, this science] to [Brahmâ] the deity who desired liberation. I offer him my obeisances, the king of the yogis, S'ukadeva Gosvâmî, the personal manifestation of the Absolute Truth who freed [Parîkchit] the grace of Vishnu who was bitten by the snake of material existence. Oh Lord of Lords, You are our Master, therefore please make it so that we life after life may rise up in bhakti at Your feet. I offer my obeisances to Him, the Supreme Lord, whose congregational chanting of the holy name destroys all sins and to whom bowing down all misery finds its end." *: Next, so affirms the Matsya Purâna, there are besides the Purâna also a hundred thousand verses found in the Itihâsa (the single history) of Vyâsa's Mahâbhârata and a twenty-five thousand in the Itihâsa of Vâlmîki's Ramâyana. Thus the complete number of verses for the complete collection of classical stories amounts to five-hundred twenty-five thousand [the smaller Upa-purânas not counted]. **: This reminds one of the theme of Krishna as being the Time or Kâla, and Krishna as being the person, the Supreme Soul, the Original Person manifest before our eyes and present in the beyond. The world seems to be divided in impersonalist science, philosophy and governance on the one hand and personalistic religion of detachment and personal sentiment in civil attachment on the other. But when one with respecting the Time [of nature] as it should finds the person and with respecting the person as it should [in Krishna consciousness] finds the original Time, the problem is solved knowing the oneness of the personal/impersonal opposition to be our equal minded friend and guiding father in the beyond Lord Krishna. As the last word to this dual matter of respect for His reality He states: (in B.G. 18: 6) 'But with all these activities must without doubt, performing them out of duty, the association with their results be given up; that, oh son of Prithâ, is My last and best word on it.' Therefore we are of emancipation in devotional service, free from ulterior motives. 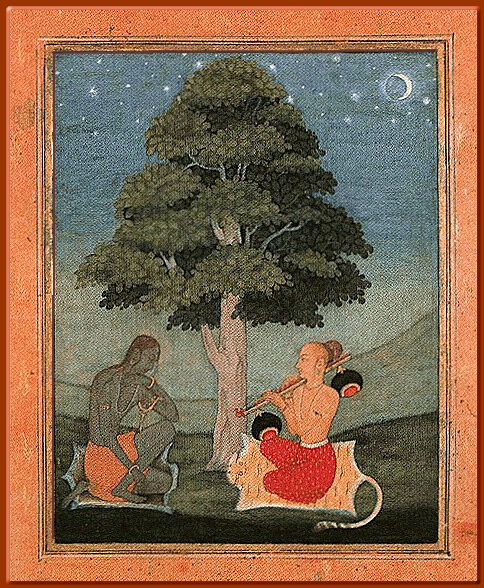 The picture is titled: 'Narada Muni and Vyasadev'. Kedar Ragini from Ragmala. Rajasthan Bikaner, c. 1690. Source.